This must be some sort of record – Dux Britanniarum lands on the doormat and a couple of weeks later we’re playing a game. We like the rules which the Lardies produce, but none have clicked with us the way this set have. We’ve had several fun games of Sharp Practice, but we never could get on with Blinds (don’t know why – they are a great idea) or remember to roll for an event when loads of dice were rolled and there were more ‘1’s than ‘6’s. 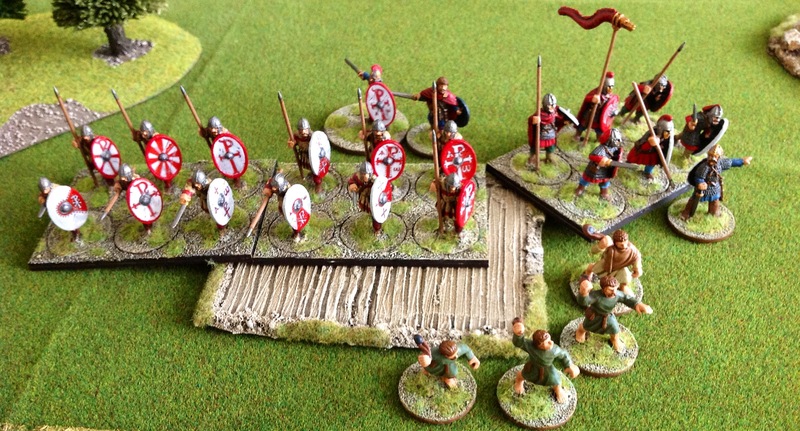 Dux Britanniarum gets around these minor gripes by not having any blinds and having a Fate Deck instead of events – hurrah! 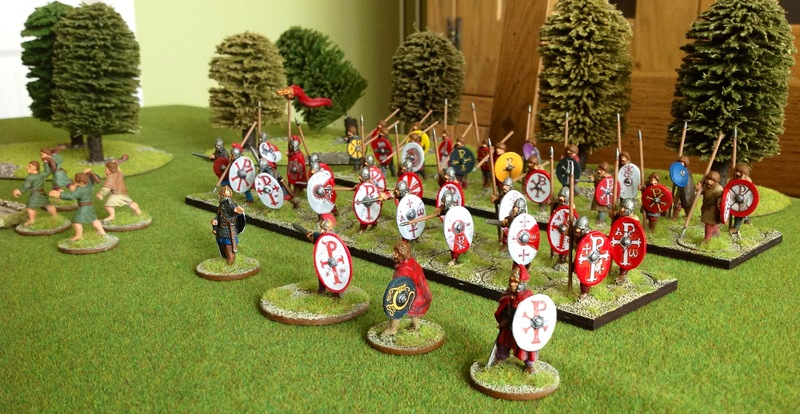 After one read through the rules, I ordered a Romano British starter army (great idea) and painted it up in 2 weeks – I must be ill!!! Saxons are from my Anglo-Dane and Viking forces for Saga, but hopefully we will have some plastic Thegns being painted up before the campaign starts in earnest to replace the guys swinging the 2-handed axes with gay abandon. The scenario we picked for our first try-out of the rules was the “one man and his dog” one, where raiding Saxons have to herd some livestock across the table before the Roman British can stop them. 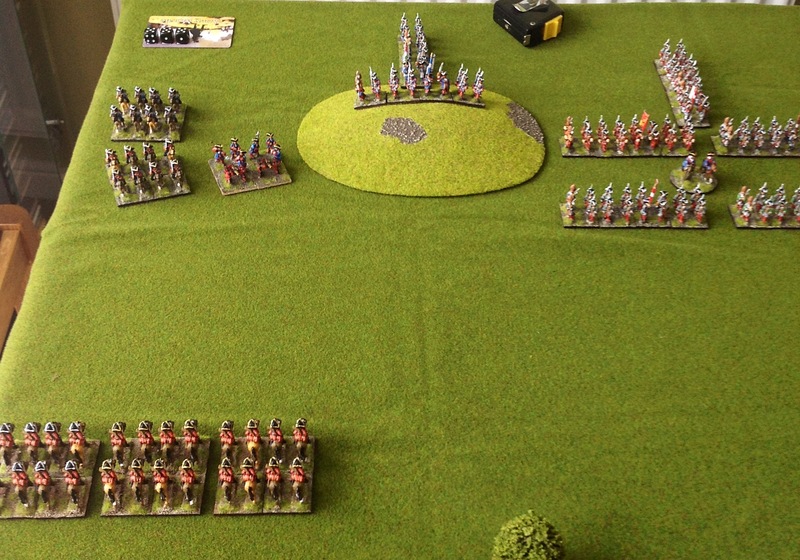 The British got to bring on 3 units at the start of the game, rolling the right centre area for their deployment zone. My Saxons were going to fight off the British with their elite units, while the Warrior units did the herding – the Saxons had to get 2 groups of pigs off the table to win. Turn 1 did not start well for the Saxons. The Big Man cards for the 3 units of warriors with the pigs came out quickly, but I rolled doubles for the 2 groups on the left (this means the livestock veer off in a random direction) and they ended up chasing their pigs around a wood, whilst the single group of warriors who also rolled a double (!) moved very close to the British Elites and Levy in pursuit of their pig. 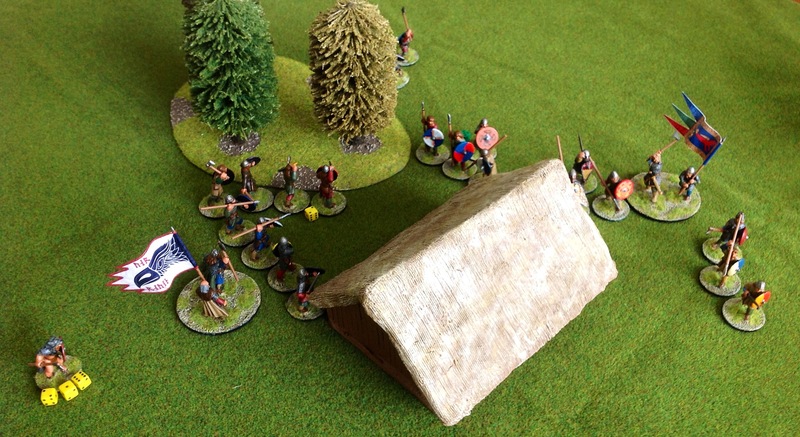 The Saxon elites moved straight up the road hoping to pin the inevitable shield wall against the board edge by threatening to outflank the damned thing. 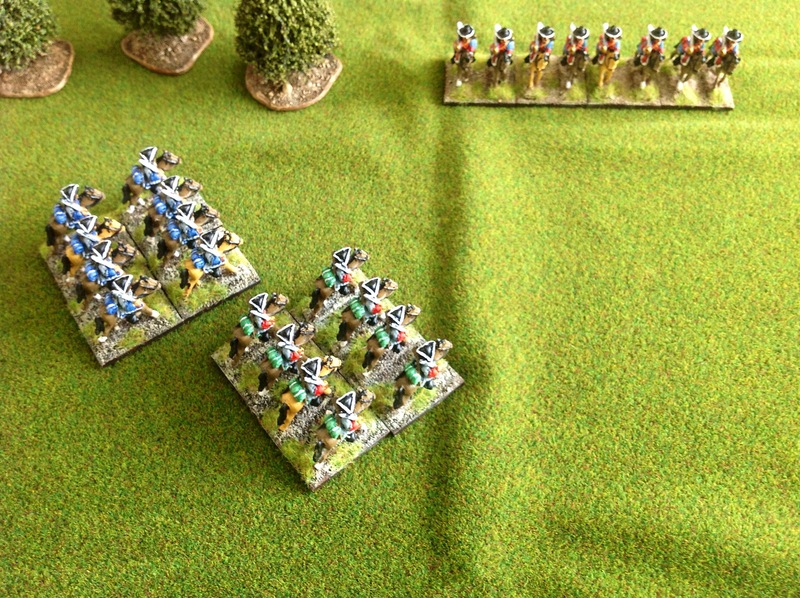 The British spent their turn shuffling about waiting for reinforcements to arrive, but with high movement rolls some of them would be in position to strike on turn 2 – damn! On turn 2 after their mates arrived, the British elites felt bold enough try to charge the single group of Saxon warriors with the pig, but I played a Goad Fate card to stop them short and right in the path of my Lord and his elites. The Saxon Lord card came up next, so I ordered a charge against the British elites with my Lord leading 2 groups of elites against one. The sneaky British turned tail and ran (they had an evade card, another useful Fate deck card) meaning that no battles were fought on turn 2. 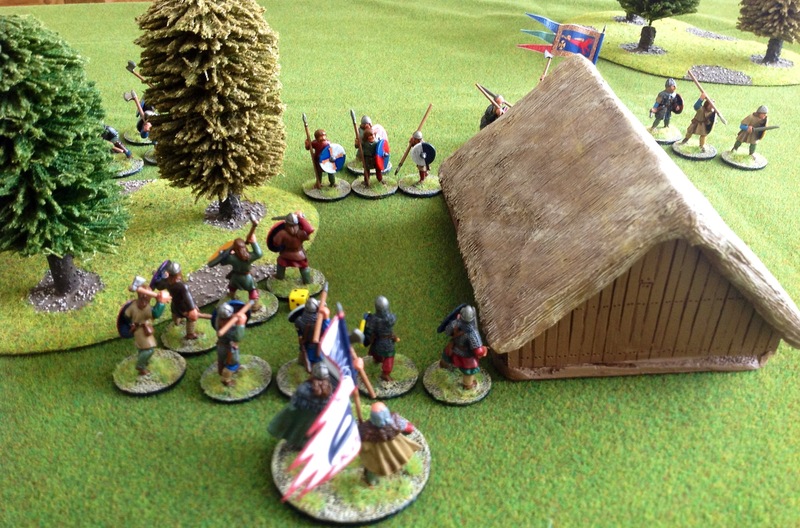 The rest of the turn was spent by the British getting into formation and the Saxons in the wood going nowhere as they rolled a double 1 for movement – the dice Gods were shining on me as usual! On to turn 3. The Saxon Lord & 2 elite groups charged the British shieldwall of 2 warrior & 1 elite group, which had been formed just in time by the British Lord (his card came up first, followed by the Saxon – the Saxon prayed it would be the other way round, but it was not to be – did I say I was the Saxons?). 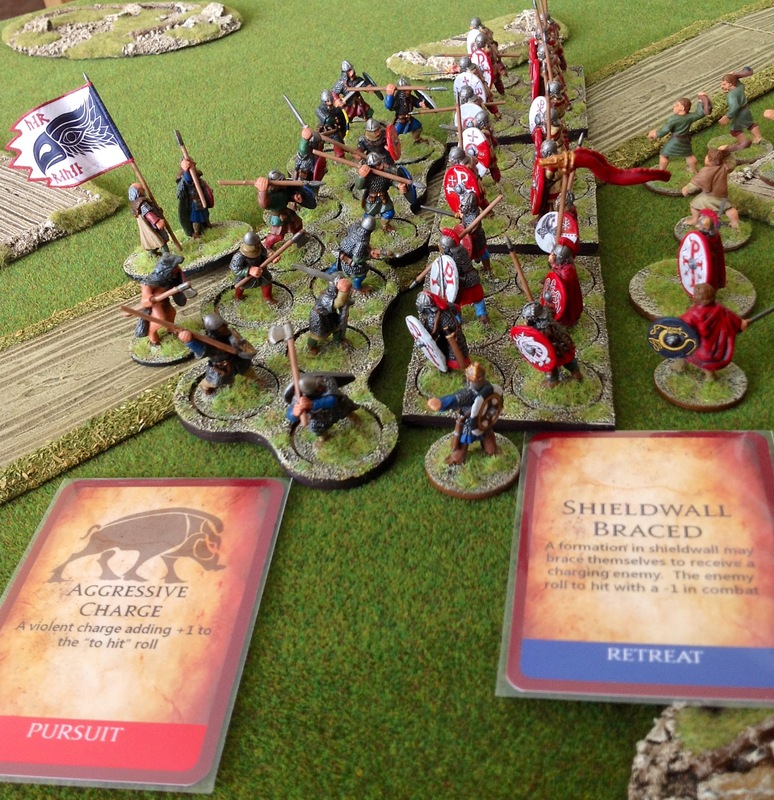 Surprisingly, no-one had a “Seize the Day” card, but the British had the “Shieldwall Braced” card which cancelled out the Saxon “Aggressive Charge” card – double damn! Of course, the Saxons came off worst losing 3 men to the British none and so had to fall back 3″ due to the shock (of losing to peasants, though worse was to come). The pig-herding Saxons on the flank continued their slow progress towards the edge of the board which would give victory, while the other British leader whipped his levy into formation on the flank of the Saxon warrior line. On Turn 4, once again the British Lord card came up first, and he ordered the British shieldwall to follow up into the retreating Saxons, but victory was not so swift this time – the combat went on for 4 rounds over 2 activations, but when the dust settled the Saxons elites had been broken or wiped out and the Saxon Lord had to run back to join the warrior group which had previously lost their pig to a bunch of levy. The only good thing from the Saxon point of view was that the British champion had fallen, taking a sword thrust intended for his lord. The pig-herding Saxon warriors continued to try to move their charges down the flank, but the British skirmishers had moved across to them so they were now being harassed by slingshot as well as making continuous poor movement rolls. 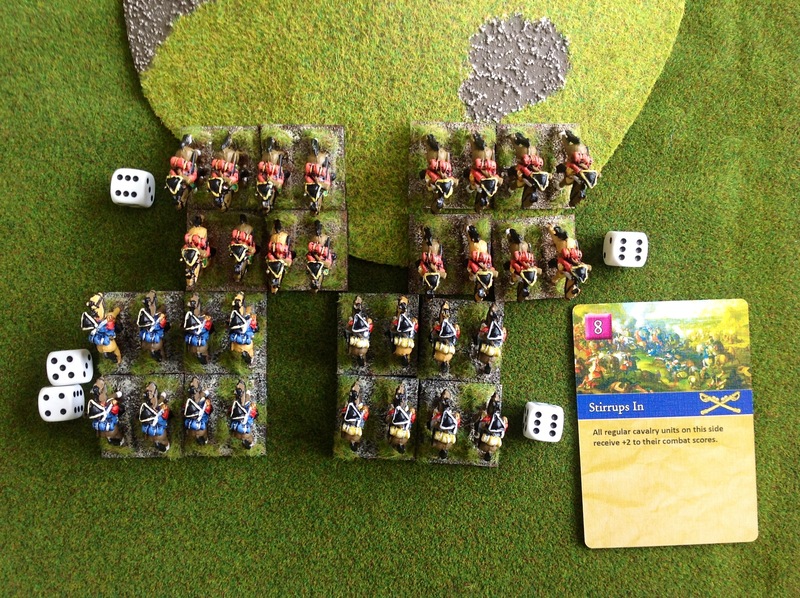 Turn 5 and the British Lord card came out first again, so he ordered a regular group to charge one of the flanking Saxon warrior group with pigs, trampling the Saxon bowmen in the process. Amazingly, he took a wound and lost the combat, falling back 1″. Maybe the pigs might get off the board after all…. It was not to be – the British leader with the Levy was now activated, and ordered the formation of Levy to charge the Saxon warrior group which their Warlord had sought refuge with. Again, the dice gods deserted the Saxons and the peasant Levy beat them up so badly that they had to leave the field at end of turn due to excess shock, taking the Warlord with them and sending the Saxon Army Morale below zero. This ended the game and put paid to the Saxon pig rustling on the flank as they lost the will to fight and melted off into the country side with no filling for their bacon butties. I lost badly as the Saxons – I think I only won 1 combat and was beaten twice by Levy with pitchforks. On the other hand, my archers were quite successful, dishing out 2 kills and some shock – this was not going to win me the game though. The British shieldwall which they managed to form in the nick of time was dead tough – I lost count of the number of kills it saved by being in the formation. 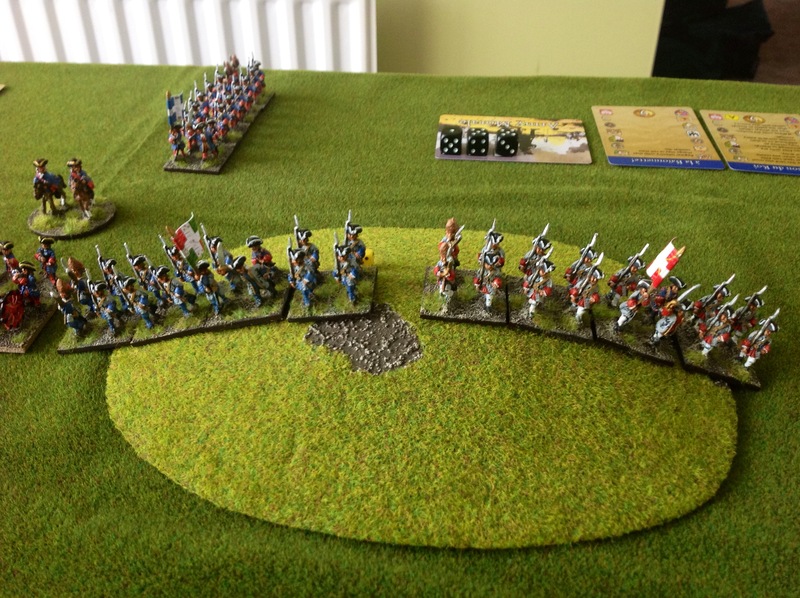 The movement trays, though they sped up the game, confused us for a time – we were trying to wheel on the corner of the tray etc, but we didn’t have to do this as the mass formation is fairly flexible. Only when in shieldwall formation is wheeling necessary and most manoeuvres can be done by just subtracting 1D6 from the movement. The Fate Card Deck added a lot of spice to the game, never mind that I couldn’t pull a Carpe Diem card to save my life – this allows you to play more than 1 card in a turn, which can make for some devastating combos in a fight. Tom pulled all 3 of mine but didn’t pull one of his own until the final turn, and as we didn’t make it through the deck I was never going to see one – in the end I had to press the attack without one, which ended predictably given my usual dice rolling. The game was a really good introduction to the rules, and has given us an appetite for the campaign system where casualties matter – if this had been a campaign game I may well have thrown the towel in earlier. Highly recommended. Summer is definitely here as they’ve even let nursing students go on their holidays, so now Tom is back home for a few weeks. 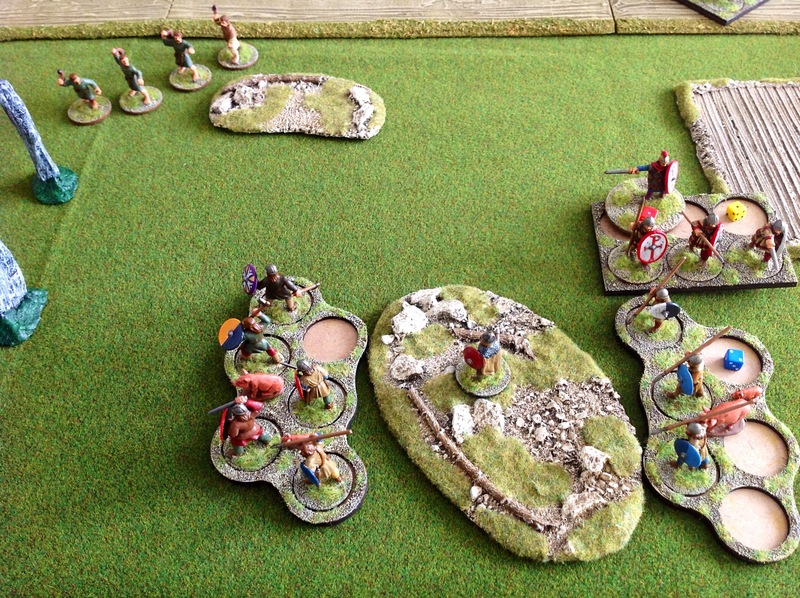 I’ve been painting up Viking and Anglo-Danes of late hence our first outing was always going to be Saga. Tom was the Anglo-Danes and I was the Vikings (each of us with a 4 point warband) playing the “Kill the Warlord” scenario. The random terrain generation led to a very crowded central area, with a wood and a building filling the middle of the board. I had the first turn but both of us were jockeying for position and trying to build up some abilities on our boards. On turn 2 I charged a unit of Coerls with a unit of my Bondi and did quite well in the melee, killing 3 of them for 1 of mine. I tried to follow up my success by charging in again, but the Anglo-Dane ability of Intimidation came into play and my charge stalled. On their turn the Anglo-Dane Huscarls pumped up with a few good abilities went after my weakened Bondi, wiped them out (7 of them in one fight!) all for the loss of one Huscarl. Inspired by their betters, the reduced unit of Coerls then launched themselves into my Berserkers. Tom’s plan was a good one – he might lose the Coerls but he hoped to fatally weaken the Berserkers so as his Huscarls could mop up. The plan went badly wrong, but not from his point of view – his Coerls with the Lords of Battle ability rolled a total of 8 dice against my Berserker’s 16 dice, but miraculously they scored 5 hits to my 2. I fluffed all but 2 of the saves and 3 Berserkers went to Valhalla for the loss of 2 Coerls – looking on the bright side, his victorious Coerls were blocking the Huscarls from getting to my remaining Berserker, but the Anglo-Danes weren’t going to let me off that easily. 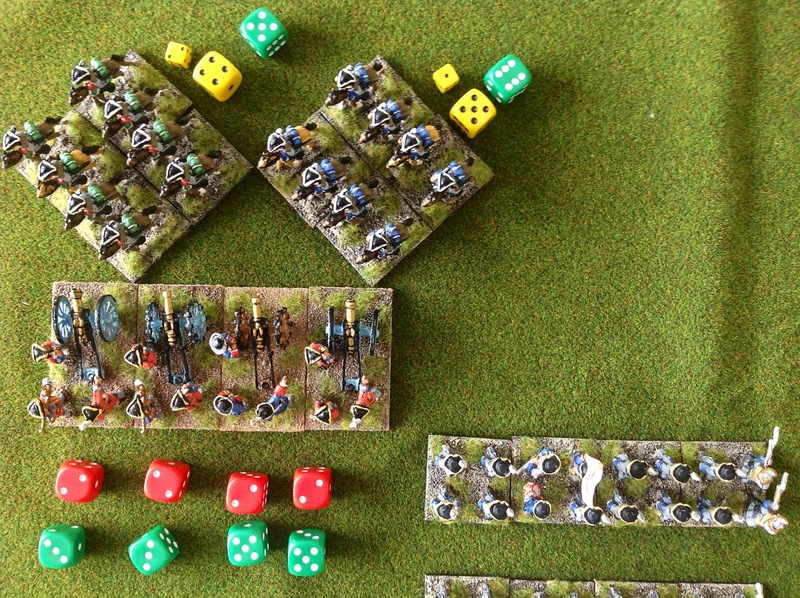 As the Berserker disengaged, the Anglo-Danish ability of Lords of Battle added 2 fatigue dice to the 1 he had already giving him 3 in total. On my turn the Saga dice let me down badly – never mind that I was 1 dice down for the loss of my Bondi unit, I rolled the equivalent of a load of 1, 2 & 3s, so couldn’t get many abilities on my board. In the end, I could only withdraw my berserker and launch my remaining Bondi against the Anglo-Dane Coerls behind the building. The melee was a blood-soaked draw, with each of us losing 4 figures. 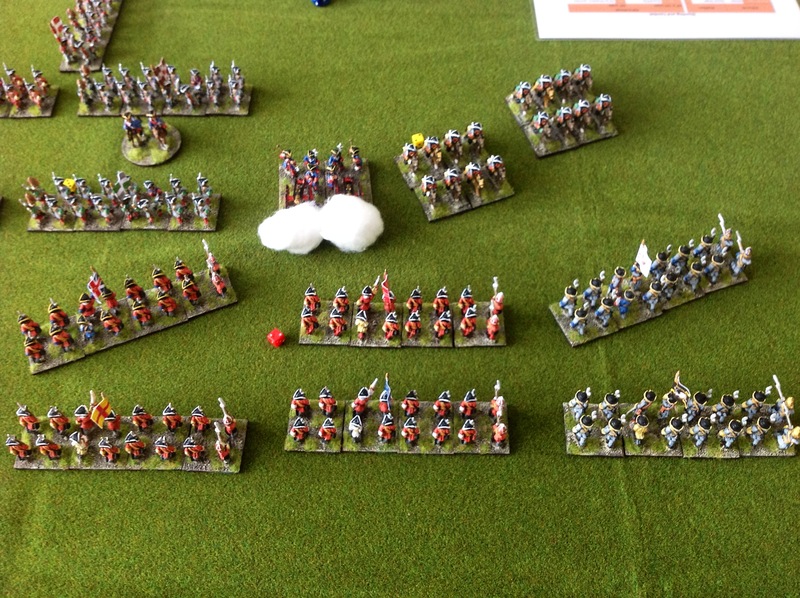 Tom played a very conservative turn, resting his units and building up abilities on his battle board. We could both see what was coming on my turn – the ever-victorious Coerls were down to 3 models, and the Vikings have an app for that called Loki which allows you to discard 2 specific Sage dice to remove a unit of 3 or less Warriors/Levis. The question was of course, could I roll the values needed on the 5 dice I had left to roll and still have enough decent dice left over to do the other things which needed doing (resting the 3 fatigue Berserker for example). In 3 turns I never rolled the dice I needed to do this, so the Coerls limped along to the end. I drew off and rested a bit on turn 4 when I didn’t roll the dice I needed, but a quick count of VPs made me realise that even if I did kill the Coerls through the Loki ability, I would need a few more VPs to win. There was some desultory skirmishing on turn 5 after I again failed to roll the dice I needed, but nothing changed on who was going to win, so on turn 6 (again with no dice worth having) I charged Tom’s Warlord with mine supported by a lone (but very well rested) Berserker. Surrounded and outnumbered, the Berserker died, but surprising my Warlord through a combination of luck and some battle board abilities wasn’t even scratched, but we had run out of turns so it was game over. A fun game, though I think the scenario suffered from us both having 4 point forces instead of 6. My disastrous start left me really short of troops and Tom, canny lad that he is, realised that even if I could kill off his unit of 3 Coerls, he would still be winning unless I killed his Warlord. He was unwilling to advance and risk that, so he spent his dice resting his men and removing fatigue where possible. I didn’t have sufficient men left to goad him into attacking, so the banzai charge with the Warlord and single berserker was the only option open to me at the end, but against a well-rested enemy there was always only going to be one result. So what next? I have a Breton starter force to paint, but I think I need to concentrate on getting the Viking and Anglo-Dane forces up to 6 points and play a few more games before I get distracted with the Bretons – Norman Saga dice (which the Bretons also use) are like gold dust at the moment so there’s not exactly any rush…. So finally we get to have a face-to-face game of Maurice – anticipation has been high for this set of rules, and I’m glad to say they didn’t disappoint. The rules and cards are pretty intuitive and a seasoned CDG player like Nick was soon twisting the knife into me with clever use of his cards – I on the other hand couldn’t seem to draw a high command value card to save my life on the first trawl through the deck – excuses, excuses! Anyway, after a die roll for randomising sides, I was fated to be Marlborough (though no French general was ever going to see the inside of my coach) and I chose to attack after winning the scouting roll. A random generation of terrain produced 2 swamps, a hill and a forest in my central deployment zone, a forest in my left-hand deployment zone and only a hill in the French right deployment zone, which promptly became the objective. 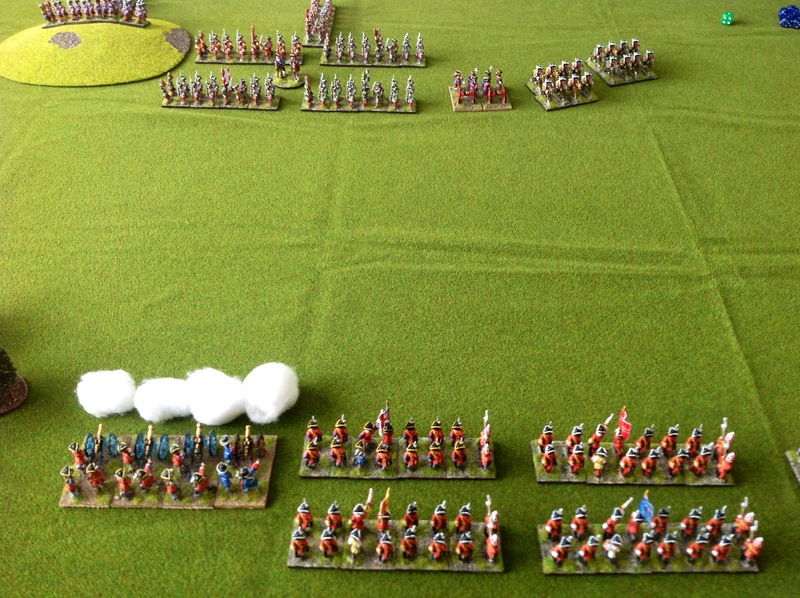 The French general deployed his Guard infantry behind the crest of the objective hill (100 years ahead of Wellington!) 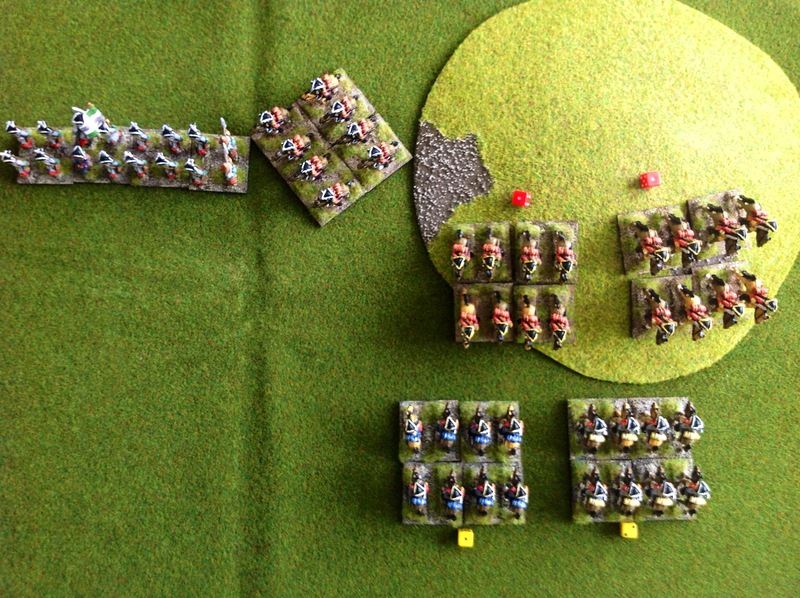 with his Guard cavalry and another unit of cavalry supporting them on their right between them and the board edge. The rest of the French force was strung out to the mid-point of the board, where their flank was anchored on another 2 units of horse. The British flanking force made good progress, but due to a lack of high value cards Marlborough had to stick pretty close to them, leaving him unable to co-ordinate the simultaneous central infantry thrust as I kept drawing low value command cards. I suppose I could just have bombarded and kept drawing until I got a decent hand, but my initial cannon aim seemed to be a bit off, so I chose to press on with the flank attack and hoped the central assault could catch up later (fool!). Even outnumbered 2 to 1, the French guard cavalry just refused to die over numerous rounds of combat, and kept rallying off the resulting disruption (we played the outnumbering rule slightly wrong here – we were subtracting 1 from the French combat score, whereas it should have been 2 due to both British units engaging ONLY the French Guard horse). I managed to work my spare horse unit around the French flank to take out 2 French cannon, but they were then stung by Guard infantry musketry into charging the horse supporting the Guard horse. 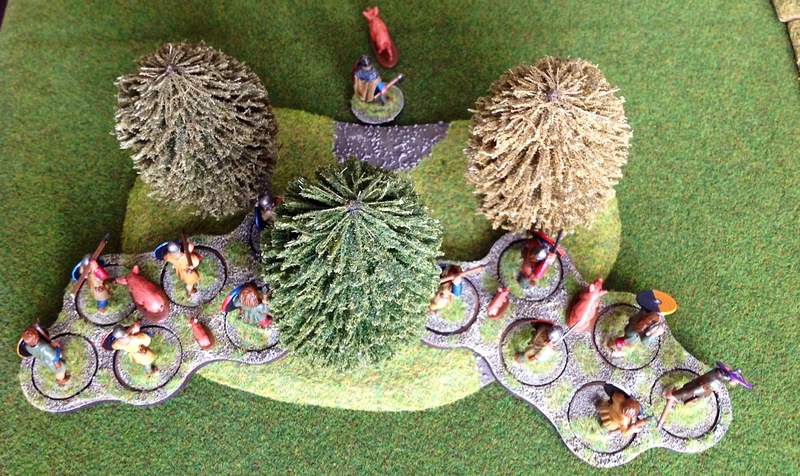 In a marginal call we decided that my horse hadn’t flanked his, and they bounced off even though they won the melee (though luckily they were now out of fire arc for the pesky Guard infantry on the hill). At this point I woke up and realised that all this charging about with horses (glorious and honourable though it was) was just burning through the deck and not sapping the French Army morale much at all, so I activated the central infantry and started the long march towards the French lines. 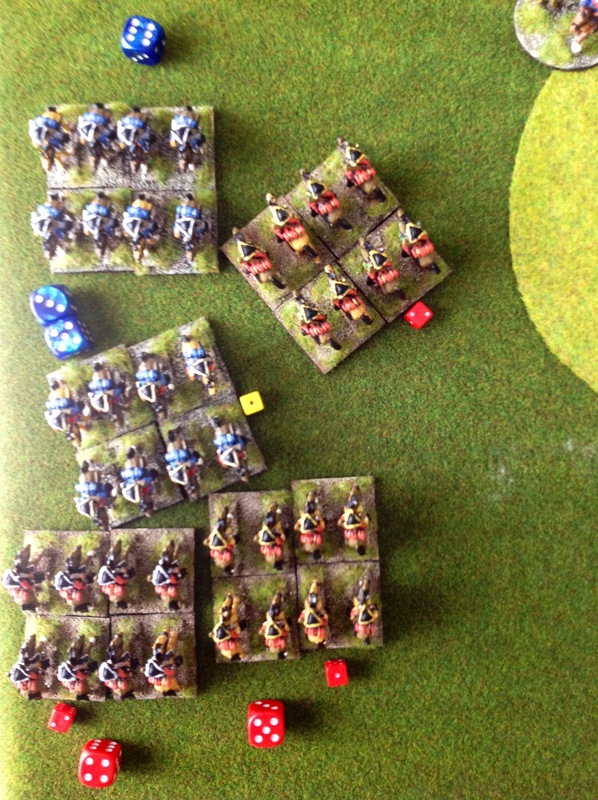 During this lull the French rallied their 2 units of horse and put in a charge against my 3 damaged units of horse. 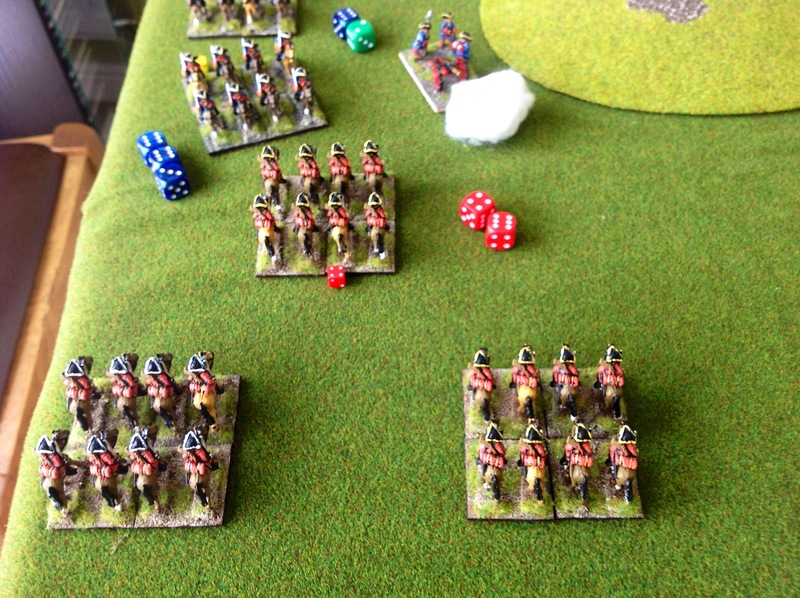 The beastly French Guard horse took on 2 units of my horse, and rolled a 6 to add to their impressive 10 combat factor – predictably both my horse rolled 1 or 2, were promptly doubled and auto-broke taking 6 points of British Army Morale with them. 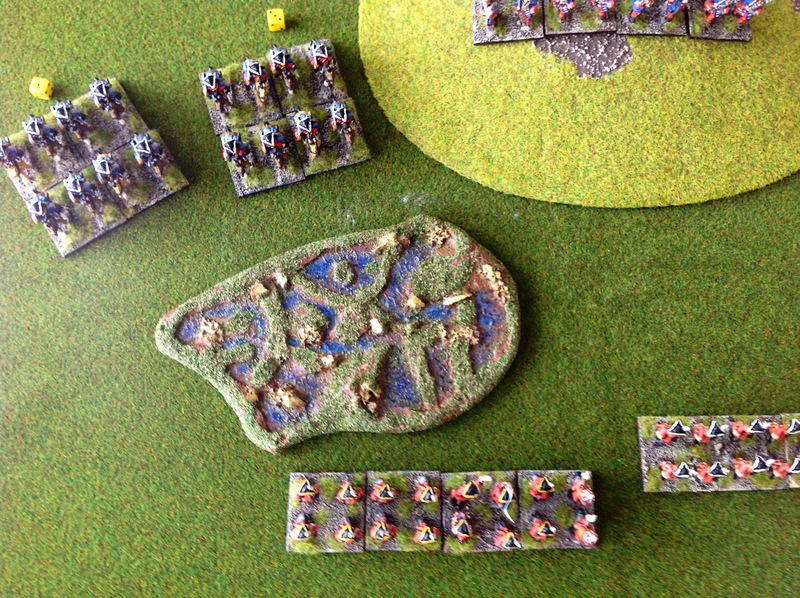 A follow-up volley took out the third unit of my horse, so my left flank was now held by a single unit of infantry! Luckily, I had an event to help me out – with a cackle I plonked down a marsh between the triumphant French horse and the single infantry unit left on my flank using the “That’s not on the map” card (even though a lengthy, swirling cavalry melee had taken place over the very same ground beforehand, miraculously none of the horse units involved had stumbled into this huge morass). Meanwhile in the centre I had finally got my infantry into small arms range and a large-scale musketry and artillery duel had started. Infantry units were broken on both sides by fire, but even with my advantage of re-rolling missed disruptions I couldn’t silence the French artillery with musketry and they did terrible execution in my packed ranks. In a attempt to break the stalemate I summoned the Dutch horse I had unwisely placed far out on my right flank (I still don’t know why) – this move burned a few high-value cards and we were already on the third run-through the deck, so time was running out. A combination of volleys and the Dutch horse broke both the French horse units but at minimal loss in French Army morale – the further loss of the last French artillery battery didn’t even impact on their morale at all, so clearly these Frenchies were made of stern stuff! With 3 cards left in the deck, the French could have practically ended the game by passing and drawing all 3 cards, but sportingly they charged the Guard horse and their supports across the mystery marsh into my waiting infantry. They couldn’t make a dent in my infantry, bouncing back into the marsh and taking further disruption in the process, but the lack of cards meant this was literally the last roll of the dice – my remaining 2 cards were value 4, so I quit the field and it was game over. Army morales were actually quite close at the end, with the French having 5 remaining and the British 4, but I think I would have been really lucky to win as my attack was spent and there were 3 French infantry units who hadn’t even been engaged as yet (never mind the Guard on the hill who were back at full strength). Though the re-shuffle card did come up very early in the second deck meaning the game was shorter than expected, I don’t think my army morale would have lasted much longer even if I did get a few more card plays. 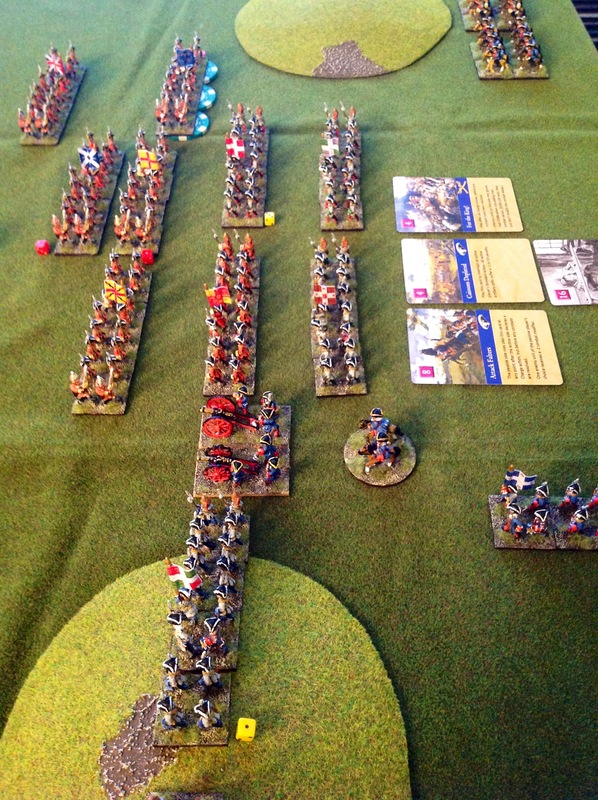 There were lots of other fun moments during the game – for instance, the play of the “Confusion” card when the French forced a disrupted unit of my horse to charge a fresh unit of their horse. My horse were so confused that they inadvertently clipped one of the French artillery batteries on the way in and wiped them out in the fighting – a bit of a result for me as the main cavalry melee was indecisive. And speaking of confusion, the merry dance my infantry in march column supporting the left flank cavalry performed in deploying from march column into line had to be seen to be believed – in true period fashion, you have to march parallel to the enemy, then left turn to form a line – I had skipped over this bit in the rules, so ended my move with the head of the column facing the enemy – ooops! By the time they had formed up facing the right way, my cavalry had been routed and were mere specks on the horizon. So, at just over 3 hours to play to a conclusion with one of us never having played the rules before, this was a fun experience. Maurice gets a thumbs up from us. On Friday evening I had a try-out of the Maurice rules before my up-coming game with Nick on Sunday. Although Maurice units in their raw form are a fairly generic representation of 18th century armies, there are National Characteristic cards which allow you to modify the units to represent the strengths and weaknesses of the nations in the war you are simulating. As my armies are for the War of Spanish Succession, the British/Dutch had Great Captain (for Marlborough) and Lethal Volleys (representing platoon firing) characteristics while the French had A la Bayonette (better in hand-to-hand combat) and Maison du Roi (giving them 2 Guard units). The objective was on a hill which French chose to camp 2 infantry battalions and some artillery around, so the British decided to concentrate their force on the opposite flank while holding the objective flank in place with 2 infantry battalions and 1 cavalry squadron (all Dutch), all the while pounding the enemy on the objective with a grand battery of 4 guns. After an ineffective opening bombardment (despite some +1 bombardment cards), the infantry assault kicked off with 6 British battalions facing off against 4 French. Things looked to be going badly for the French until a marsh appeared in front of one of the leading British battalions (the hilarious “That’s not on the map” card), who then rashly charged through it but were driven back in the ensuing melee into the marsh to rally and lick their wounds. This front descended into a fairly ineffective fire fight while each side collected cards, until the British decided to force the issue with their cavalry. The plan was for 2 squadrons to engage the 2 squadrons of French cavalry, and at the same time the 3rd British squadron would attempt to take the end French infantry battalion in the flank. Unfortunately, one of the French squadrons was the much vaunted Maison du Roi, and as the initial combat totals with the addition of a cavalry combat card show, they are not to be toyed with …. I don’t fancy those odds much! Luckily the British rolled high while the French rolled low, so the result was a bit of a Mexican stand-off as the British drew off. However, the 3rd British squadron did get the charge in on the left-most French infantry battalion, but remarkably they withstood the charge, drove the cavalry off then followed up with a volley to add insult to injury. Meanwhile, the French general had quietly been marching his cavalry in the opposite flank towards the Dutch contingent. Even though they were quite a distance away from the general, a couple of cards which allow you to activate any force on the battlefield regardless of distance allowed them to get within charge range of the patrolling Dutch cavalry. The British general was distracted by having to perform a rally action on his depleted cavalry facing the French guard, so this allowed the French the opportunity to declare a charge on the Dutch cavalry. In a decisive melee, the Dutch cavalry disintegrated, leaving the British grand artillery battery exposed. Forced to burn cards to perform a bombardment action, the artillery inflicted some disruption on the cavalry, but not nearly enough. 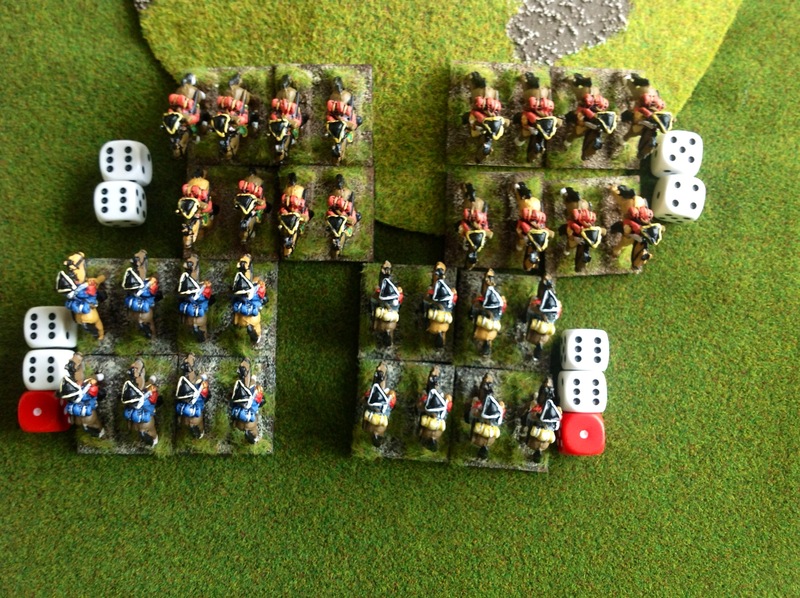 The French had just enough command span on his remaining cards to order a charge, and in a one-sided fight, the British artillery were wiped out. British army morale was now down to 5 (started at 16) while the French was still just in double figures at 10, and as I had tried out most aspects of the rules I left it at that. Initial impressions are very good – Maurice reminds me a bit of Command & Colours Ancients with the hand management and mad bits of action in an area followed by lulls as players seek to rebuild their hands up before attacking again. It’ll be interesting to try the card mechanics against a canny opponent like Nick.